This Tamper Evident laser material has a dull silver look to it and a VOID self adhesive, that if removed after application leaves a VOID pattern indicating tampering. Can be printed on a Desktop Black and White or Color Laser Printer (For HP: Tuff Paper Setting). This material may be applied to metal, glass, or polycarbonate plastics and left to dwell for the VOID to show when the label is partially or fully removed. The adhesive is a clear acrylic adaptable to many surfaces with a minimum application temperature of 50°F and a service range of -40°F to 302°F. On rough surfaces or low energy surfaces, 102351 shows an excellent random tamper proof pattern. 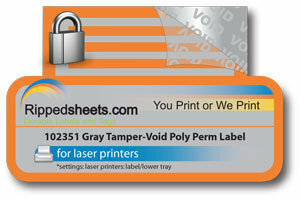 This is a matte top-coated laser printable tamper evident metalized silver void polyester film. It is coated with a permanent, pressure sensitive acrylic adhesive and backed with a backside-printable, two sided, poly coated, tissue backed release liner. The tamper evident feature of this product becomes permanently nonfunctional after exposure to 104°F (40°C) temperature. This product is UL recognized for indoor/outdoor use with occasional exposure to lubricating oil and water.